Welcome to Window Sunscreens Phoenix! We are Phoenix's #1 Sunscreen Installation company and we are the most affordable! ​We specialize in keeping your home or business cool from the extremely hot Phoenix Arizona Sun. When the Sun is blazing the number one cause for hot homes and high energy bills is not having windows that are installed with the solar screens to block UV rays. Window Sun Screens in Phoenix AZ are critical in keeping you home and family cool from the Arizona heat and saving you money on your energy bills. Phoenix Arizona is the largest metropolitan area in the entire state of Arizona! The population is a staggering 1.6 million people! With that population though also comes millions of homes. Without a doubt the best and smartest investment, especially in Phoenix Arizona for your Comfort and Energy Savings is to have Sun Screens installed on your windows either at your home or place of business. Sun Screens come in many different shapes, dimensions and sizes. Every home is different, and with that in mind we offer fully customizable sun screen options for any style of home or business. Keeping you home or business cool and energy efficeint is and will always be our number one priority. How much do Sunscreens cost? Sun Screens usually run on average between $75-$100 a window but could cost more if the window is a custom window or larger than normal. For the best estimate fill out the free estimate form above and describe additional details for us to give you a sun screen quote or give us a call at 602-529-3803. I'm really interested in getting Sun Screens, what's the first step? The first step to enjoying your new sunscreens and reaping the benefits above is to have us come out to your home or business to give you an on-site estimate. 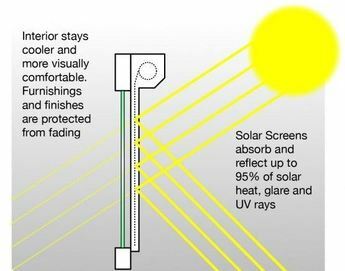 We need to take a look at all your windows and measure them for your custom Sun Screen order. Once we have everything measure and completed in the home, we will process your payment and then proceed with order all the necessary sun screens for the job. We want to make sure we are 100% accurate with your sun screen order to make sure that your home sun screens in Phoenix are installed without any problems! How long does it take to install Sun Screens? Sun Screens usually take a few hours to install on an entire home or business in Phoenix. For each window we are removing the old screens and also taking the necessary steps to install the hardware (if necessary) to hold in place the new sun screens. The process is generally pretty painless and doesn't require and damage to your homes walls or windows. When our experienced sun screen contractor Phoenix arrives he will go over all the installation steps before beginning the project. Who is your Sunscreen supplier? We use Phifer Sunscreens and fabric on the majority of our suncreens and work, We have found that they manufacture the most dependable and long lasting screen material on the market. Phifer Phoenix also offers a wide selection of colors and thickness of sunscreen material as well making them the most diverse and preferred solarscreen provider for Phoenix Arizona! Other Benefits of Window Sunscreens in Phoenix? Solarscreen? What's that? Solarscreens are also the same thing as Sunscreens. They go by the name 'Solar Screens' also just like Sunscreens go by the name 'Sun Screens'. I know what your thinking. Why are there so many variations on the name? Simply put, some people like to spell the terms as separate words and some like to spell them as a single word. In the end, they all represent the same thing and serve the same purpose: Blocking the UV Rays from the Sun! What are the benefits of Sunscreens? 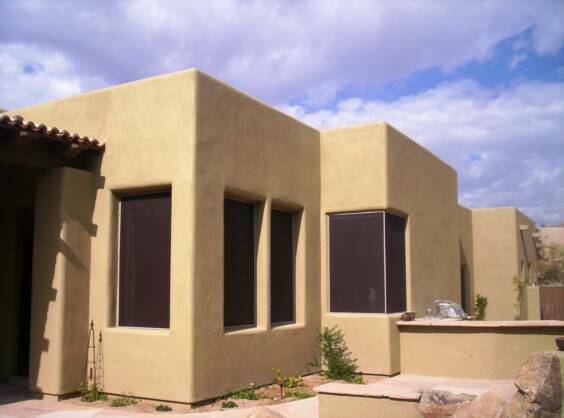 There are two HUGE benefits to having Sun Screens installed in your Phoenix Home or Business. 1.) Sun Screens keep your home cool. Not just a little cool. Substantially cool. Up to 20 degree less cool! You will love coming home after work and not needing to keep the Air Conditioning on full blast while your gone to keep your house or business cool. 2.) Sun Screens lower your Energy Costs / Power Bill. Why waste hundreds of extra dollars a month on your Air Conditioning bill when you can have Solar Screens installed on your windows to reduce the inside temperature of your home! Do I get any APS or SRP incentives with Sun Screens in Phoenix? Only with SRP. This is great because they will lower your power bill costs and they are definitely in favor Phoenix Residents taking the necessary actions involved to lower their power consumption, especially during peak afternoon hours! Sun Screens with SRP (or without) is a no brainer! For more information on SRP rebates please give us a call! Having your house windows tinted and shaded in Phoenix Arizona is extremely critical in making sure you keep you costs down and also making sure you keep you home cool. Our solar screens are the best and most affordable in the industry. We use heavy duty, quality screens to prevent wear an tear and breakdown from the Arizona heat. We make sure we customize and fit the screen precisely to every homes exact window dimensions. We can assure you that we install all our jobs in perfection. ​Call Window Sunscreens Phoenix AZ for expert service and advice regarding solar screens for your home.